EPIC Insurance Series: What is an Umbrella Policy? An umbrella policy is a type of insurance that provides extra coverage when the liability on the original policy has been exhausted. The purpose of the extra coverage is to help protect you and your assets from major lawsuits and claims. It also provides coverage for things that are normally excluded from standard liability policies. What Does Umbrella Policy Cover? The reason why it’s called an “umbrella policy” is because much like an actual umbrella, it extends coverage far beyond what is normally covered by standard insurance policies. Umbrella coverage can be applied to almost any insurance policy, including homeowners, boat and auto. Why is Umbrella Policy Important? Many people opt for an umbrella policy because it offers extra peace of mind. It helps protect your assets in case a judgement is issued against you for a large amount of money that your current insurance policy will not cover. If you can’t afford to pay that judgment, then the court can come after your assets. Investments, retirement accounts, checking/savings accounts, future income, house and vehicle are all considered assets in the eyes of the law. Accidents happen all the time and it provides an extra layer of security that most find comforting. Umbrella policy is unique in that it offers many different protections outside the scope of a normal insurance policy. For example, it will also cover professional liability. Doctors, attorneys and even financial planners can benefit greatly from the extra coverage. Professional liability insurance only offers supplements to any existing liability policy for the business. The umbrella covers specific liabilities, such as advice to a client that results in some form of a loss. Accidents can happen at any time to anyone—from complex auto accidents to simple slip and falls. Like an umbrella that shields you from the rain and other elements, an umbrella policy provides an added level of protection in the event of an accident. 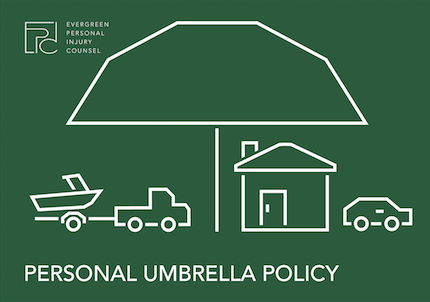 If you have any questions on umbrella policy as it pertains to a potential injury claim, get in contact with one of our attorneys at Evergreen Personal Injury Counsel. We have years of experience helping people get the advice and justice that they deserve.